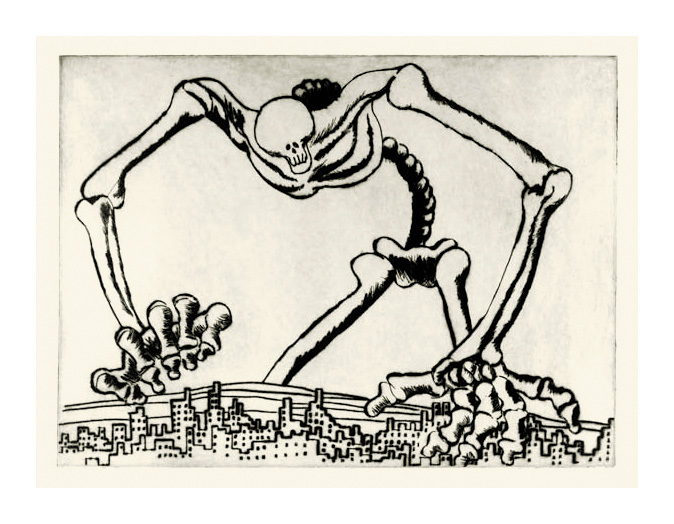 recluse–described by an artist colleague as a 'walking question mark with no use for success'–he left behind him a remarkable body of work that is only now coming to be known. 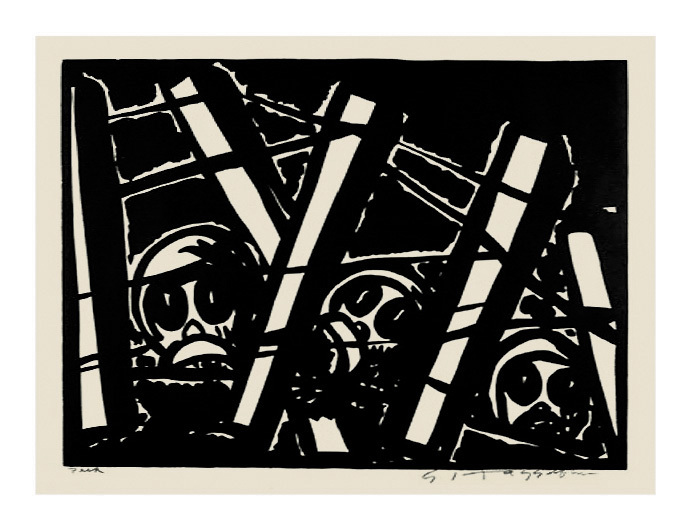 This work suggests that it is fair to appraise Hagedorn as the most important Expressionist artist to have come out of California." 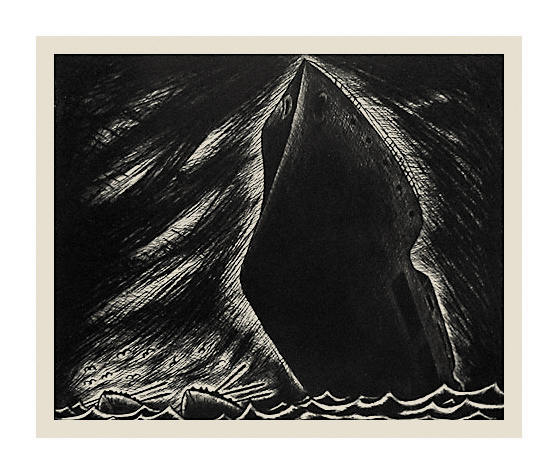 Collection of 18 selected linocuts, etchings, and drypoints. Including but not shown below: The Rainbow, Three's a Crowd, Mercy, Machine Gun, Lightning Striking a Mountain. Please call for the collection price. 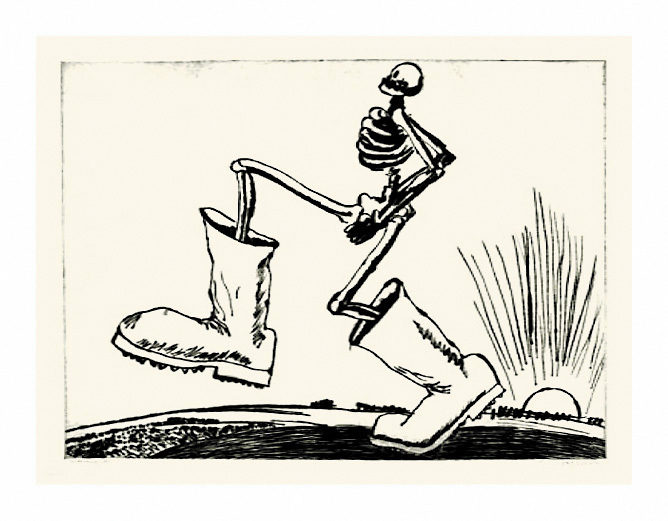 Big Boots- - c.1935 - 40, Etching and Drypoint. Image size 14 13/16 x 8 3/4 inches (376 x 222 mm); sheet size 17 1/8 x 11 5/8 inches (435 x 295 mm). A superb impression, with rich burr, on cream laid paper, with full margins (1 to 1 1/2 inches); in excellent condition. 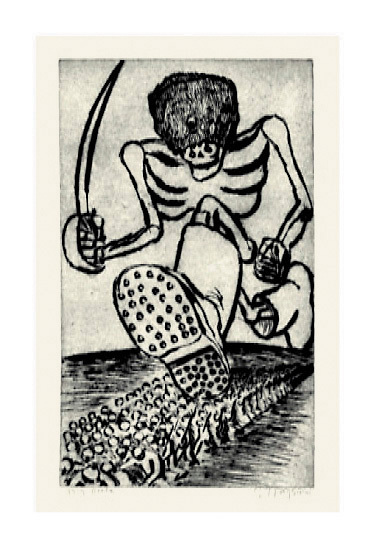 Marching On - - c.1935 - 40, Etching and Drypoint. 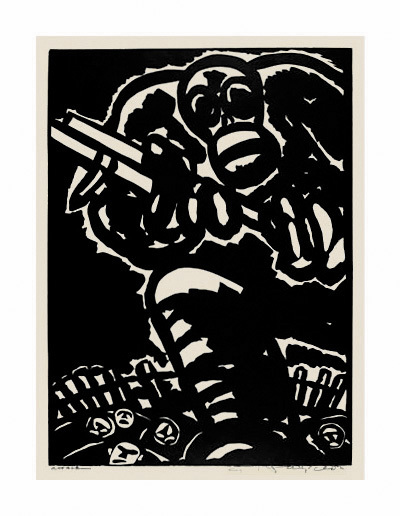 Image size 15 3/4 x 21 1/2 inches (400 x 546 mm); sheet size 17 1/8 x 23 1/4 inches (435 x 591 mm). A superb impression, with rich burr, on cream laid paper, with full margins (5/8 to 7/8 inch); in excellent condition. 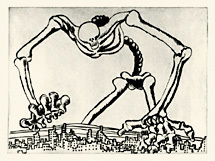 Death Overtakes the City- - c.1935 - 40, Etching and Drypoint. Image size 15 7/8 x 21 11/16 inches (403 x 551 mm); sheet size 24 x 17 7/8 inches (610 x 454 mm). 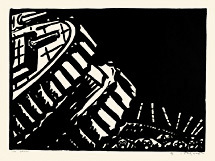 A superb impression, with rich burr, on cream laid paper, with full margins (1 to 1 3/8 inches). Original brown paper tape on the four sheet edges, well away from the image; otherwise in excellent condition. 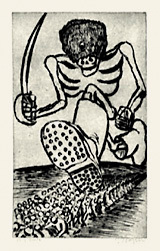 Night Attack- - c.1935 - 40, Drypoint. 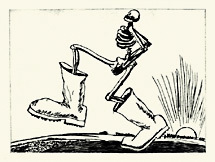 Edition c. 25. Signed and titled in pencil. Estate stamped bottom right sheet corner, verso. Image size 8 3/4 x 14 7/8 inches (222 x 378 mm); sheet size 12 5/8 x 18 7/8 inches (321 x 479 mm). A superb, richly inked impression with selectively wiped platetone, on cream laid paper, with full margins (1 7/8 to 2 inches); in excellent condition. 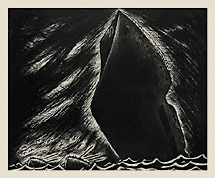 Lifeboats- - c.1935 - 40, Etching and Drypoint. Edition small. Signed and titled in pencil. Estate stamped bottom left sheet corner, verso. Image size 13 x 16 inches (330 x 406 mm); sheet size 16 1/2 x 18 7/8 inches (419 x 479 mm). 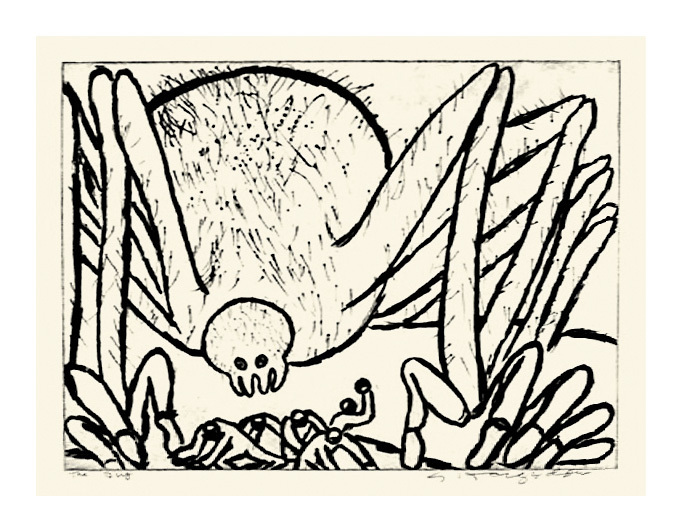 A superb impression, with rich burr, on buff laid paper, with full margins (1 1/8 to 1 7/8 inches). Brown paper hinge remains on the top sheet edge, recto, well away from the image; otherwise in excellent condition. 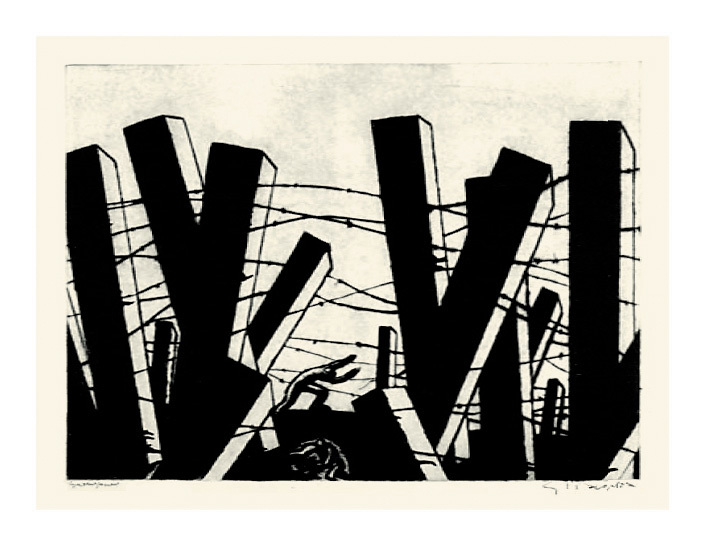 Entanglement- - c.1935 - 40, Etching and Drypoint. 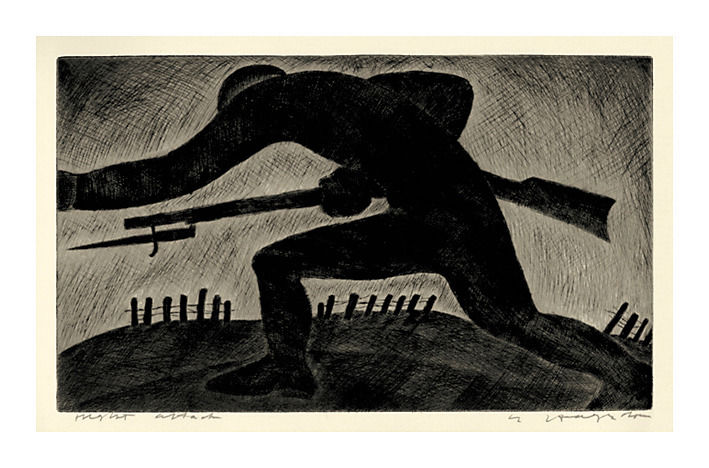 Image size 15 11/16 x 21 11/16 inches (398 x 551 mm); sheet size 17 1/4 x 22 7/8 inches (438 x 581 mm). A superb impression, with rich burr, on cream wove paper, with full margins (1/2 to 7/8 inch); in excellent condition. Scarce early state with the second figure, bottom center. 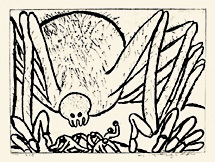 The Bug- - c.1935 - 40, Etching and Drypoint. Image size 15 3/4 x 21 5/8 inches (400 x 549 mm); sheet size 19 x 25 1/4 inches (483 x 641 mm). A superb impression, with rich burr, on cream laid paper, with full margins (1 1/2 to 1 7/8 inches); in excellent condition. Hail, Caesar! 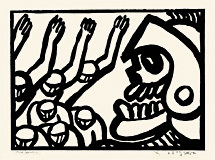 - - c.1935 - 40, Linocut. Image size 16 x 22 1/8 inches (406 x 562 mm); sheet size 17 7/8 x 25 1/8 inches (454 x 638 mm). 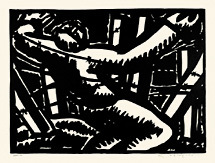 A fine black impression, on cream wove paper, with full margins (3/4 to 1 1/2 inches). A repaired crease (barely visible) in the top left sheet corner, 3/8 inch away from the image; otherwise in excellent condition. 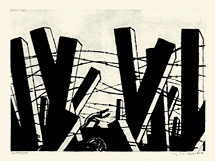 Debris- - c.1935 - 40, Linocut. Image size 15 15/16 x 21 13/16 inches (405 x 554 mm); sheet size 19 x 24 7/8 inches (483 x 632 mm). A fine black impression, on cream wove paper, with full margins (1 1//2 to 1 5/8 inches); in excellent condition. 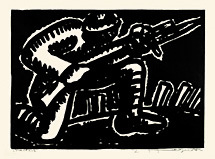 Waiting- - c.1935 - 40, Linocut. Edition small. Signed and titled in pencil. Estate stamped bottom right sheet corner, verso. Image size 16 x 22 1/8 inches (406 x 562 mm); sheet size 18 x 24 inches (457 x 610 mm). A fine black impression, on cream wove paper, with full margins (7/8 to 1 1/4 inches); in excellent condition. 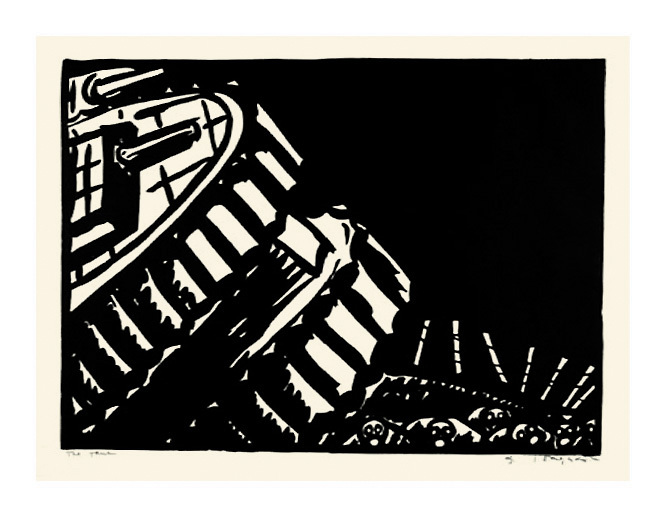 The Tank - - c.1935 - 40, Linocut. Image size 15 7/8 x 22 inches (403 x 559 mm); sheet size 18 x 24 inches (457 x 610 mm). A fine black impression, on cream wove paper, with full margins (3/4 to 1 1/2 inches); in excellent condition. A short (1/2 inch) repaired tear and minor loss in the lower left sheet edge, well away from the image; otherwise in excellent condition. 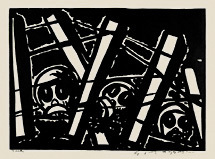 Peek- - c.1935 - 40, Linocut. 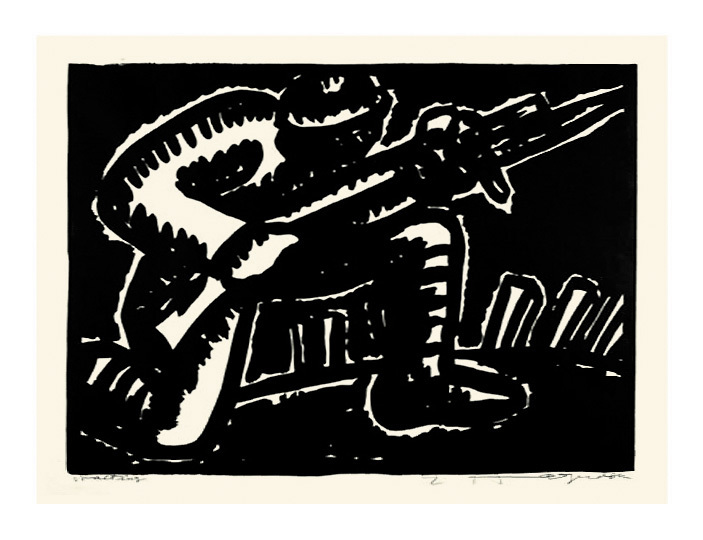 Image size 15 15/16 x 22 1/8 inches (405 x 562 mm); sheet size 18 x 24 1/8 inches (457 x 613 mm). 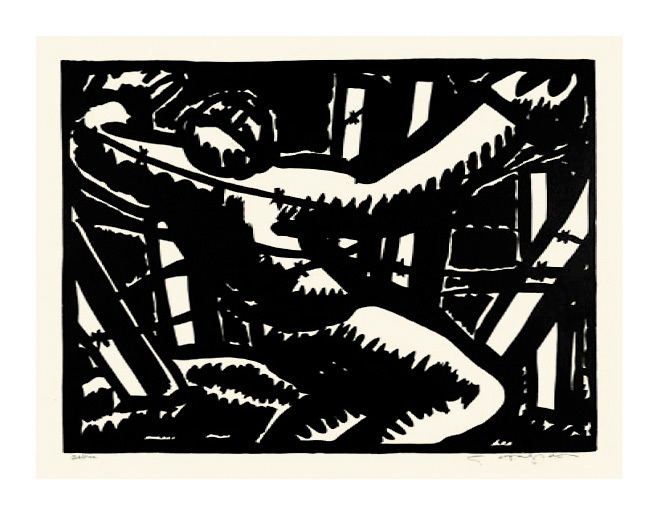 A fine black impression, on buff wove paper, with full margins (7/8 x 1 1/4 inches). Minor loss (1/8 inch) in the top center sheet edge, well away from the image; otherwise in excellent condition. 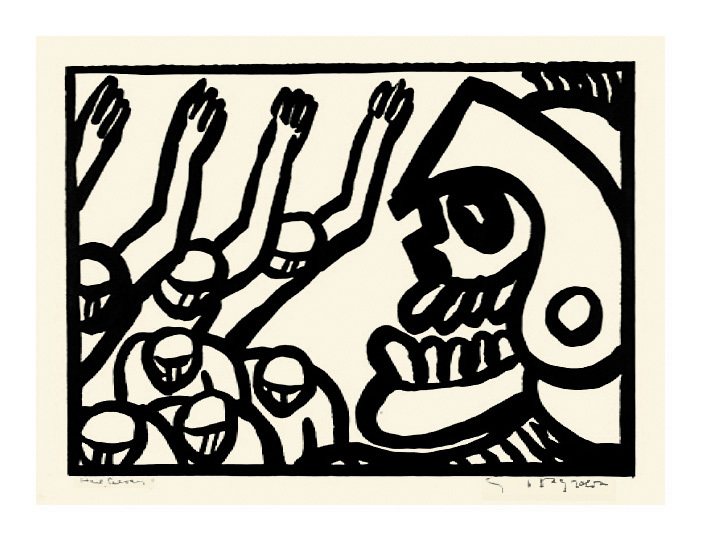 Attack- - c.1935 - 40, Linocut. Image size 22 1/16 x 16 inches (560 x 406 mm); sheet size 25 x 19 inches (635 x 483 mm). 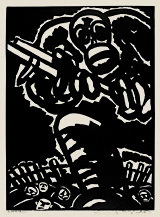 A fine black impression, on buff wove paper, with full margins (1 1/4 to 1 5/8 inches); a short (1/2 inch) repaired tear in the upper left sheet edge, well away from the image; otherwise in excellent condition.